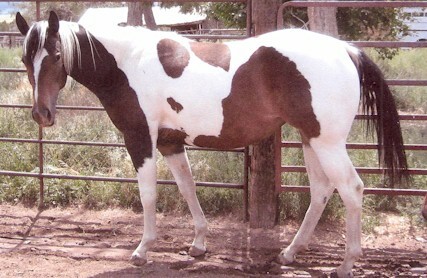 Started under saddle in the spring of 2009. Great disposition and gaits. An outstanding individual with a wonderful disposition, "Jet" has his ROM in Steer Stopping and Heading. 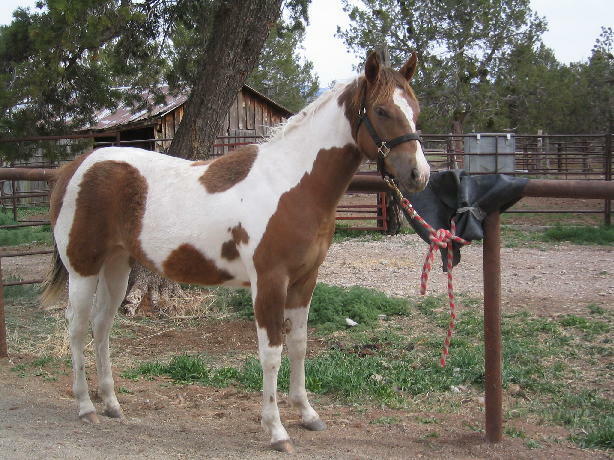 He has competed in Ranch Horse Versatility and Working Reined Cow Horse events. He has been shown in both Training and First Level Dressage. Recently "Jet" has been started in jumping fences. 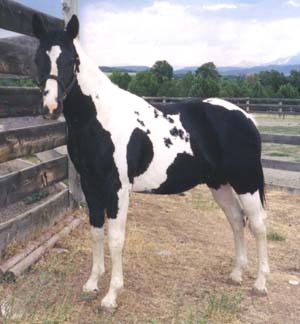 You are guaranteed color, disposition and a beautiful head with the foals you will get from this stallion. We sell his stud fee for $500 live cover. his foals or a video. 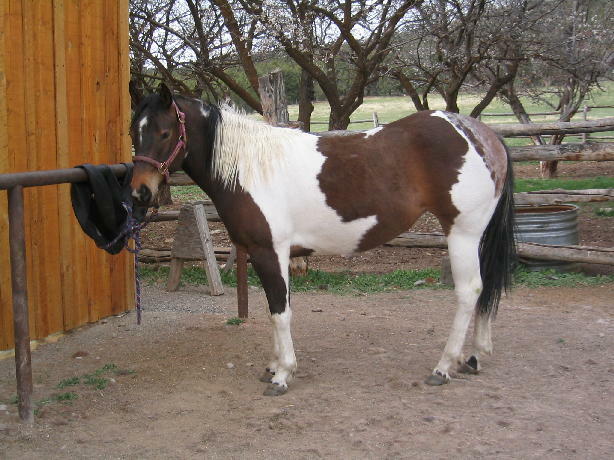 a brood mare most of her life. Saffron is going well under saddle. 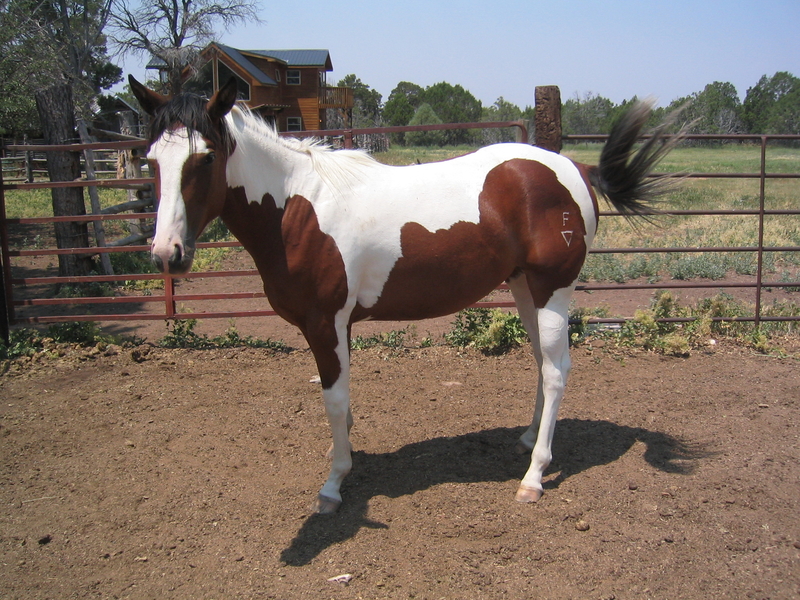 2004 APHA Chestnut Tobiano filly. Her name means "Thank you very much"
in Swahili. 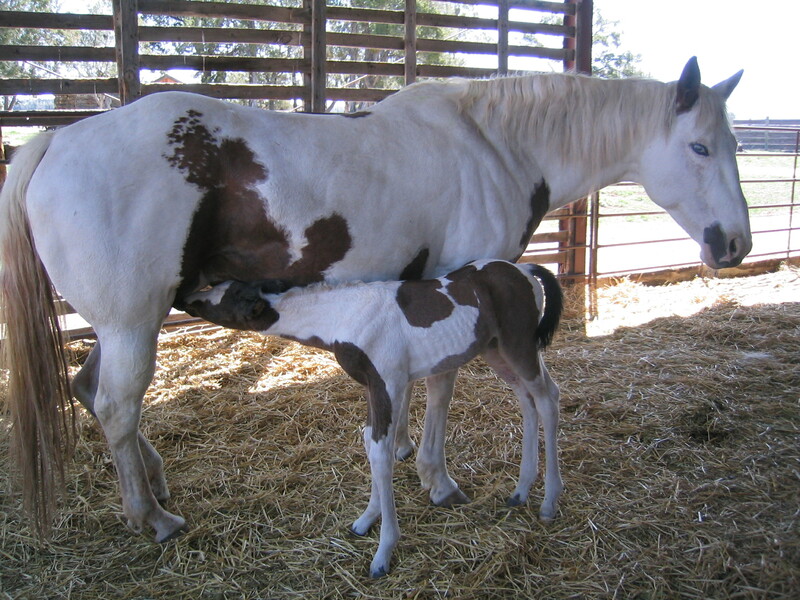 Tested positive for homozygosity, guaranteed to always produce Paint offspring. 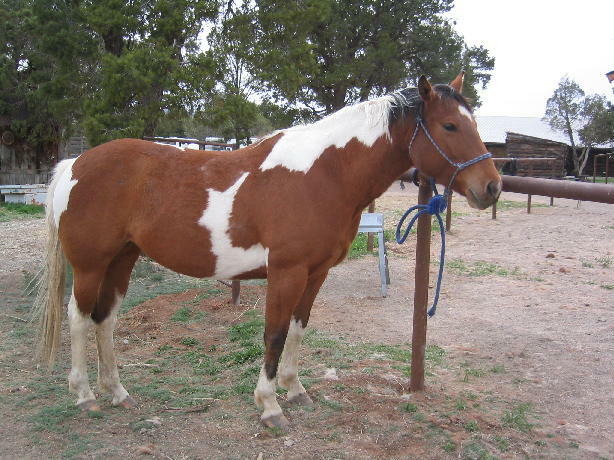 A great brood mare prospect or terrific riding horse with an outstanding refined head. A daughter of our stallion "Midway Hooray". people and an attitude to please. 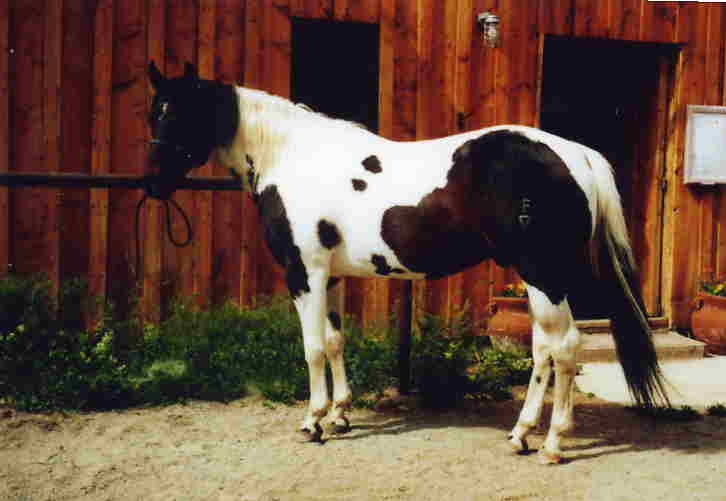 2000 APHA Black and White Tobiano Gelding. "Pairadice" is a very willing quiet horse who is eager to please. He's been started in training, and has been out on the trail. Fathered by the now deceased Sierra High Eagle who goes back to Doc Bar. On the bottom side goes back to Mr Flick. Should mature to 16 hands. Priced at $3,500. 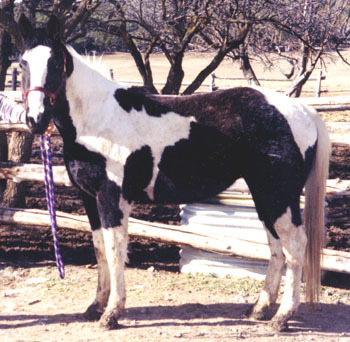 2002 APHA Black and White Homozygous Tobiano Paint Stud Colt. This could be your stallion prospect!! 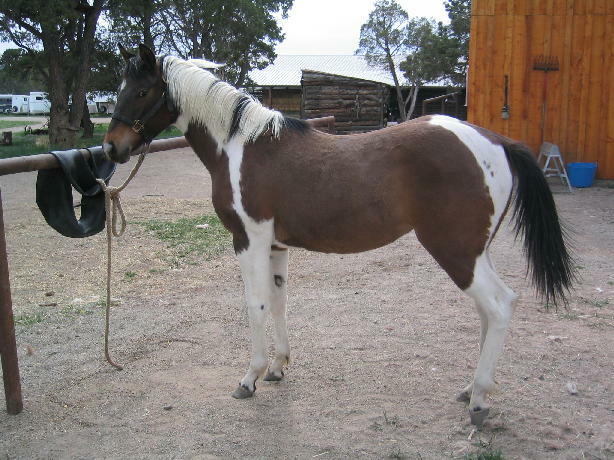 This beautiful colt is straight legged and very balanced. Goes back to Mr Flick, sired by Slicks Left Prints. Priced at $5,000.